Not related to buttercups at all and actually a sorrel, the flowers are large, yellow and funnel-shaped; the petals are 20-25mm long and borne in broad umbels. Leaves are long stalked, at ground level. The Bermuda Buttercup looks pretty, but it is a widespread weed of cultivated and waste land, roadsides, olive groves, vineyards, plantations & orchards that spreads rapidly and has a reputation for being difficult to eradicate once it has established itself and spread over an area of land. Native to South Africa, it is generally believed that the species was introduced to Malta around 1806 and within fifty years had become widespread in the Mediterranean region. The plant produces copious quantities of underground ‘true bulbs’ in botanical terms through which it largely propogates. This is one reason why it is so difficult to eradicate, as pulling up the stems leaves the bulbs behind. 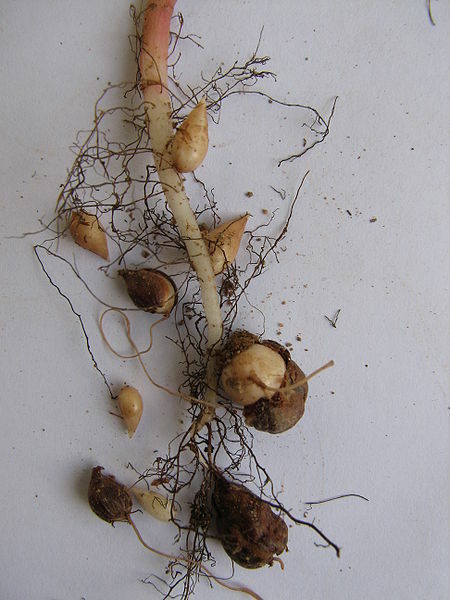 Soil in which the plant has grown is generally filled with small bulbs. It is particularly resistant to modern herbicides. The plant contains exceptionally high levels of oxalic acid, which is palatable and in modest quantities is reasonably harmless to humans and livestock. 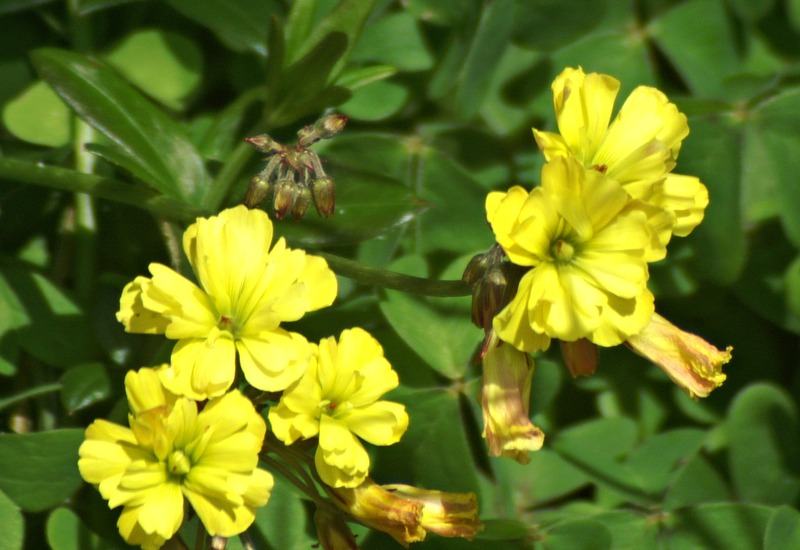 However, in spite of its comparatively benign nature, where it has become dominant in pastures, as sometimes happens outside South Africa, Oxalis pes-caprae can cause dramatic stock losses. 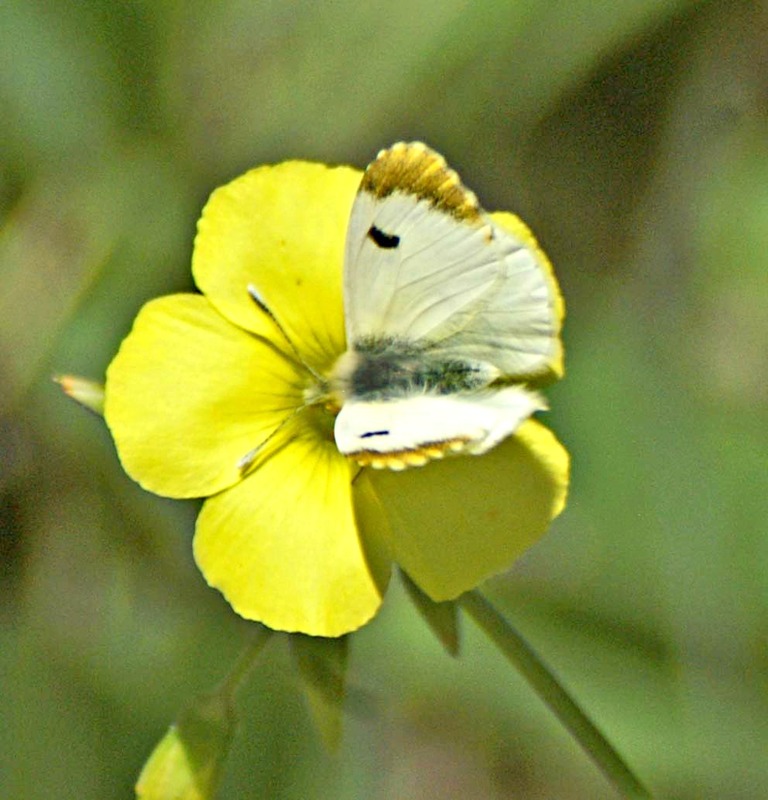 For example, when hungry stock, such as sheep are let out to graze in a lush growth of Oxalis pes-caprae, they may gorge on the plant, with fatal results, as has been found in South Australia at least. (Bull, L.; Australian Veterinary Journal, 1929, Vol. 5 p. 60). 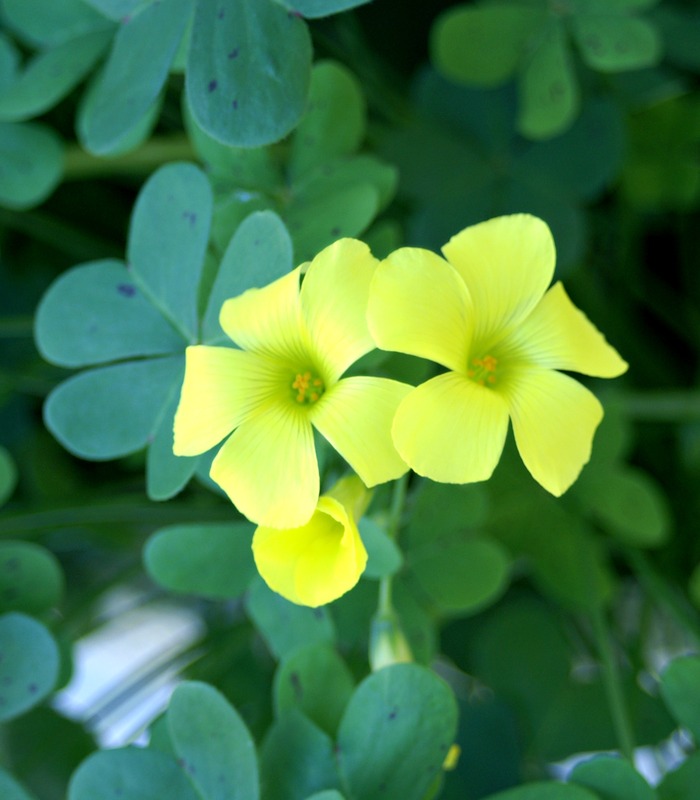 Oxalis pes-caprae is often called by the common name sourgrass or soursob due to its pleasant sour flavor. This sourness is caused by the exceptionally high content of oxalic acid. In South Africa it is a traditional ingredient in dishes such as waterblommetjiebredie (water flower stew) and the underground runners, which tend to be fleshy, have been eaten raw or boiled and served with milk. The plant has been used in various ways as a source of oxalic acid, as food, and in folk medicine. The raw bulbs have been used to deal with tapeworm and possibly other worms. The golden petals can be used to produce a yellow dye. Being in flower early in the year, the Bermuda buttercup, for all its faults does provide useful nectar to the earlier flying insects such as Violet Carpenter bees and the pretty Moroccan Orange-tip butterfly. 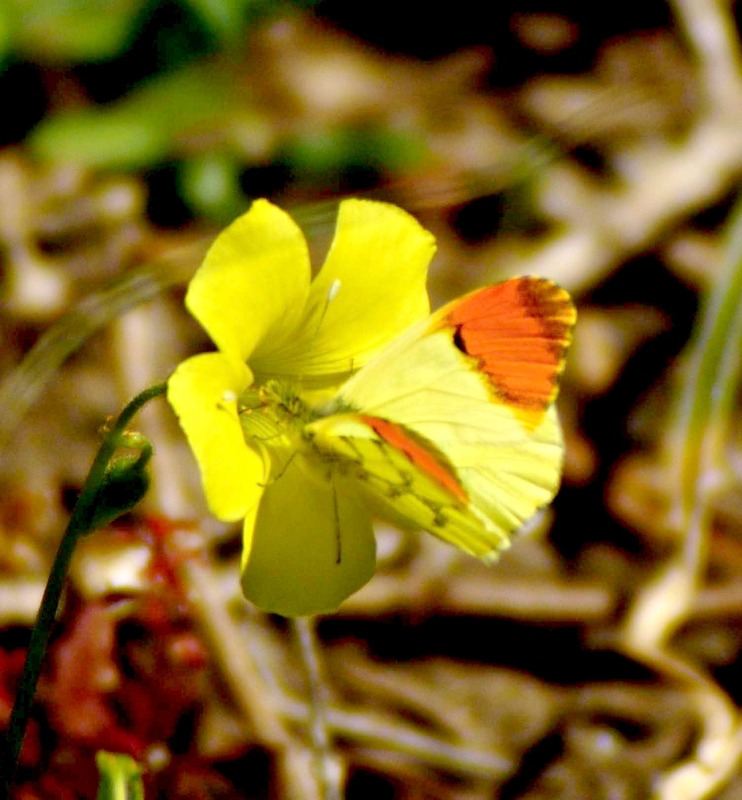 A fairly widespread species in Spain in the Spring, the Moroccan Orange tip is similar to the Orange tip, Anthocharis cardamines, found in Northern Europe but with a yellow ground colour. They are tricky butterflies to photograph as they fly quite fast and don’t settle often, but they do seem to be attracted to the flowers of Bermuda buttercup where it occurs in their ranges. Females do not have the distinctive orange wing tips, theirs are more of a golden yellow and not quite as broad. They lay their eggs singly onto their Larval Host Plants (LHPs): Buckler Mustard (Biscutella laevigata), B. auriculum & B. ambiguavarious brassica plants. The range of this species has recently “lost” its European distribution. 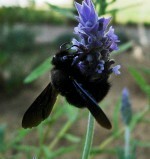 The European taxon euphenoides has been designated a new species in its own right. There are two subspecies of belia in N Africa – belia which covers most of the distribution and androgyne which flies in SW Morocco and the Anti Atlas mountains. The north African subspecies are more poorly marked on the underside hindwing, ssp. androgyne almost lacking underside markings. 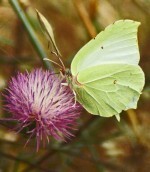 This entry was posted in Butterflies of Southern Spain, Cadíz Province, Nature, Nature of Southern Spain, Nature Photography, Wildflowers of Southern Spain and tagged Bermuda Buttercup, butterfly with orange wing-tips, Moroccan Orange tip, oxalis pre-caprae, yellow flowers on roadsides in Southern Spain. Bookmark the permalink. I like double yellow Bermuda buttercup, it is so pretty! Do you know where I can buy it? I live in Toronto, thanks!